Scale model railway designers & builders. trainsJust arrived from a "search"? If this page is not in frames click here! Have you always wanted a model railway? trainsPerhaps you never had the knowledge, skill or time to build one yourself, or have you maybe tried but never got it working properly? A common problem since any intending model railway builder needs to be an historian, carpenter, micro-engineer, electrician and (perhaps above all), an artist if the resulting model is to look stunning, work reliably and be fascinating to operate. trainsIt may surprise you to know that since 1979 COUNTRYSIDE MODELS has been solving these problems for both British and overseas customers by offering their services as professional model railway builders. During that time we have earned an excellent reputation for realism, reliability and, with over 20 years of experience, that extra little "something" which makes our models so uniquely satisfying to own and operate. Now you too can fulfil your dream of having a relaxing railway room to step into. Interested? Then read our list of FAQ's below and find out more. 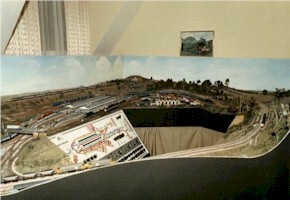 . .
trainsOur famous model of "Westbury" in Wiltshire; a "Modern Image" 'N' gauge layout we built in 1983. Dismantled last year (2002) some of it is currently being re-built by us into a brand new, "Network Rail" layout. Why would I want a model railway? Because they are great fun to own! There are also a wide variety of personal reasons. Mainly private individuals but also museums. How can COUNTRYSIDE MODELS create a model of my dreams? By asking a series of carefully thought out questions as part of a consultation process. This should provide us with all the information we need to build you a model designed to suit your specific personal interests. We do not wish to be flippant but since we can build model railways varying in price from �500 to �,000; how much do you want to spend? For in-depth details, see our pricing page. Who would I be dealing with? Just who are COUNTRYSIDE MODELS? 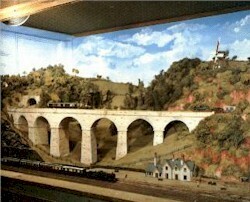 COUNTRYSIDE MODELS are the United Kingdoms leading model railway builders. We have been in business since 1979 building original and unique model railways for customers the length and breadth of the U.K.
How do I know your models are really that good? Seeing is believing. . . Why not take a look at our Gallery? If you want to know more about what COUNTRYSIDE MODELS can do for you, please choose from the list on the left or click on any of the above subjects which will reveal loads more info. . . Thank you for taking an interest in our service.